BMI has announced that it earned more than $901 million in revenues for its 2008 fiscal year, including its subsidiary Landmark Digital Services™, LLC. This is the first time any copyright organization has topped the $900 million mark for music performance revenues, and represents a 7.2% percent increase from the previous fiscal year. BMI also set a historic high in royalty distributions, and will disperse more than $786 million to the songwriters, composers and copyright owners it represents, an 8% percent increase over the prior fiscal year. With more than 375,000 songwriters, composers and music publisher affiliates, BMI is the world’s largest music copyright organization. Both figures represent milestones in royalty collection and distribution for the public performance of music. BMI President & CEO Del Bryant said, “BMI has been extraordinarily successful in signing the brightest and most popular new music creators across all genres, building upon a repertoire that already includes the most beloved songs of America’s legendary songwriters and composers.” Bryant pointed out that BMI has consistently embraced new media businesses that use music, and developed innovative licensing solutions to permit these companies to reach new audiences, while assuring that creators and copyright owners are fairly compensated. “Our pro-technology and pro-business attitude has made it possible for BMI to continue to grow our revenues more than 7% each year, on average over the past 10 years, almost doubling our income in that period,” said Bryant. BMI generated an impressive $664 million in domestic licensing income, an increase of 8% or $51 million over the prior year. BMI’s leadership in licensing the explosive growth of music in cable, satellite radio and satellite television brought in revenues of more than $208 million, accounting for more than 23% of the company’s consolidated revenue. 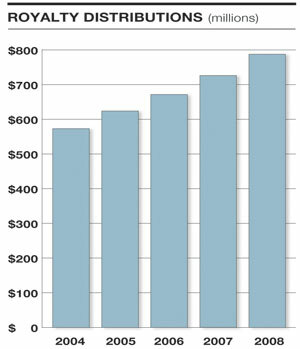 Traditional broadcast radio and television accounted for $340 million, or about 38% of revenue. Growth in revenues from the performance of music in retail and service establishments, including restaurants, bars and the hospitality industry, increased to a total of $97 million, accounting for approximately 11% of BMI’s revenue. BMI’s New Media revenues increased to a total of $15 million. Thanks to growth in the mobile, social networking and website categories, BMI now licenses more than 6,500 digital media properties, an increase of more than 50% over the prior year. 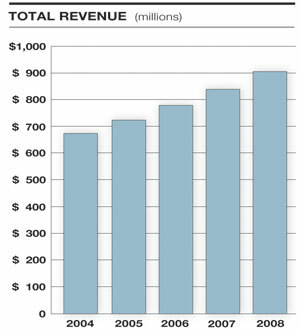 International revenues were also an especially bright spot, accounting for $238 million, or more than 26% of BMI’s revenues. During the year, BMI extended its eCommerce initiatives, significantly enhancing its business-to-business tools for songwriters, composers, and copyright owners, as well as its licensing customers. BMI added almost 30,000 new songwriters and composers to its rolls, with the vast majority joining online. The company launched new tools permitting licensees to initiate and renew contracts, report music use and pay license fees online. BMI also dramatically increased its royalty-processing infrastructure to handle the explosion of music reporting from its many digital licensees, processing more than nine billion feature audio performances during the year. The strategic use of technology in all of these initiatives permitted BMI to grow its business while lowering overhead to 11.7%, the lowest in the company’s history. BMI’s fiscal year runs from July 1 to June 30. BMI’s consolidated financial information includes Landmark Digital Services™, LLC, a wholly owned subsidiary. Landmark provides advanced audio-recognition products and services to BMI, as well as third-party clients, including content providers, copyright owners and consumers of music and digital entertainment.